Got this warning light in my car this morning. I usually have a backpack in the passenger seat. I have seen the airbag light near the radio come on and off before which is to be expected. light started going off and on partway into work. This is the first time I have seen the light come on. Not sure if I have a faulty height sensor in the passenger seat back. I do have the Clazzio leather seat covers. Mine flashes whether something is in the seat or not based on acceleration and movement. One member has black tape over theirs. Driveability is not affected but the i-MID will display the message when the light comes on which can get annoying. My I-mid is not doing that. I thought that light was based on a weight sensor in seat. Maybe yours got wet or partially disconnected during seat cover install?you may have an issue with airbag in that seat hopefully it will not trigger. Its related to weight (or lack thereof) in the pass seat as far as I've been able to tell. 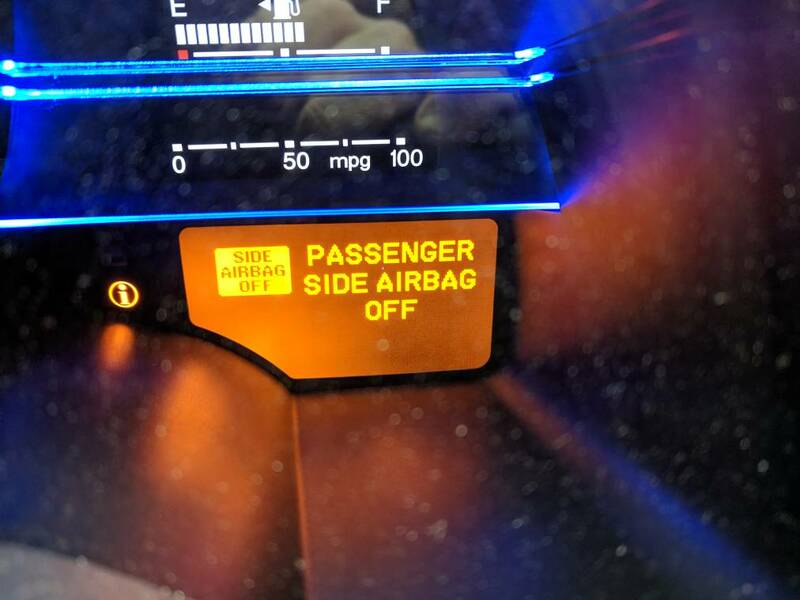 I get the indicator for the passanger airbag that turns on and off when I have a bag in the seat. this is the lite near the radio. The other lite in the instrument cluster is for the side airbag. I also have the i-MID popup with a warning that the passenger side airbag is off. It only just started today. Maybe it got wet somehow but my windows have been closed. My seat covers have been on since the end of last December. I did put a Hondata tune on the car. Not sure if that can cause the issue. I'll see if the message pops up on the way home today. I've messed with it by having my backpack in the seat (which by itself is just barely under the threshold) and applying additional pressure with my hand. I have not had any issues. This is what I see when I turn on the car. The owners Manuel says if this comes up when you start the car to visit the shop for diagnosis. The message goes away when I sit in the passenger seat. I will have to check and see what the height sensor will cost if that is faulty. Ahh that one, nope haven't gotten that. It is a weight sensor and I would unplug it and re-plug it back in and when you have it unplugged check for corrosion of the connectors. Because it is part of the Airbag system it might have a secret recall or be covered by Warranty. Since it says side Airbag it is the one built into the seat but could be the one in the window post.